VILLAGE OF PINEHURST, N.C. (Nov. 5, 2014) – Pinehurst No. 2, which hosted the U.S. Open and U.S. Women’s Open in consecutive weeks this summer, has received Golf Digest’s 2014 Green Star Award for Outstanding Environmental Practices. No. 2 was honored with the award because it has “implemented water reduction programs in startling and instructive ways.” In 2014, in fact, Pinehurst No. 2 will use about 73% less water than in 2009 – the last full year prior to the beginning of a major restoration project that eliminated Bermuda rough and reintroduced sand and native wiregrass. Reduced water consumption has been a positive byproduct of the restoration of No. 2. Conducted by Ben Crenshaw and Bill Coore and completed in 2011, the project sought to return the course to the playing conditions created by Donald Ross in the 1930s, around the time when the course hosted its first major championship and when it began to be regarded as one of the premier layouts in the country. That included restoring a single-line sprinkler system in the fairways and reducing the total number of irrigation heads to 450 from about 1,100. That was on display this summer during the Open championships when a lack of rainfall in the weeks leading up to the tournaments left its Bermuda fairways “tawny yellow, even brown in places,” according to Golf Digest. But just a month after the Opens concluded, visitors to No. 2 discovered that No. 2’s fairways had returned to green. “Pinehurst No. 2 proved it’s a championship test, even when its grass is yellow,” Golf Digest continued. Golf Digest instituted its Green Star Awards in 2009 to recognize golf facilities that “demonstrate the best in sustainable, efficient and innovative environmental practices that every golf facility could emulate.” Working with a panel of judges, Golf Digest evaluates resorts and courses on several factors: water use and conservation, energy use and conservation, waste disposal, pest and disease management, wildlife promotion, and contribution to the local environment and community. Previous winners of the Green Star Awards include Barton Creek Resort & Spa, Kiawah Island Resort, Pebble Beach Resorts, Sunriver Resort, Madden’s on Gull Lake, Barona Resort & Casino, Bandon Dunes Golf Resort and Bear Trace at Harrison Bay. Located in the North Carolina heartland, Pinehurst Resort & Country Club, established in 1895, is a 2,000-acre property featuring an award-winning spa, eight golf courses, tennis, and activities for the family. Widely known as the cradle of American golf, Pinehurst has hosted more single golf championships than any other site in America, including the U.S. Open, PGA Championship, Ryder Cup Matches, TOUR Championship and many others. In 2014, it served as the site, in consecutive weeks, for the U.S. Open and U.S. Women’s Open Championships. 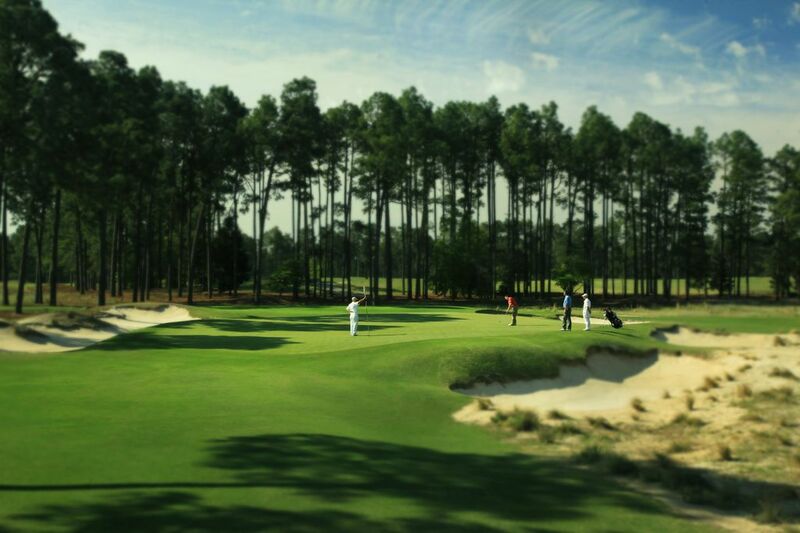 See pinehurst.com or call 800-487-4653 for a complete list of events and activities.